Evan Blass is back with the new leak, and this time it is Samsung Galaxy S10. As per the image shared on his twitter that is supposed to be the upcoming Galaxy S10 line-up. As per the image shared Samsung Galaxy S10 will come in three different variants and out of which one is going to have a dual front camera and in the leak, it is called as Samsung Galaxy S10+. However, the post explicitly states that the images are based on a case manufacturer's expectations. 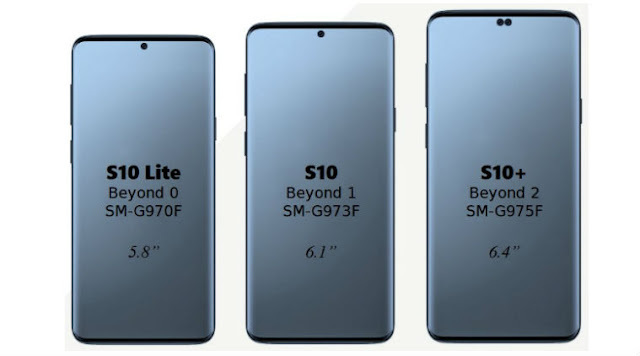 Samsung Galaxy S10 Lite will have the smallest 5.8-inch display. The phone is codenamed Beyond 0 and will come with model number SM-G970F. Up next is the standard Galaxy S10 variant with model number SM-G973F and code name Beyond 1. It will feature a 6.1-inch screen. Both the phones will have a single front camera. Samsung Galaxy S10+ with model number SM-G975F will sport the largest 6.4-inch display and it is codenamed Beyond 2. Samsung Galaxy S10 will ship with the company’s new Infinity O display with in-display camera hole for front camera sensors. Both Galaxy S10 Lite and Galaxy S10 will have a single hole on top of the screen at the center to include the front camera sensor. Samsung Galaxy S10+ will have two holes, which translates into two front cameras. The biggest variant will reportedly have a total of six cameras – four at the back and two on the front. Samsung Galaxy S10+ could offer a screen-to-body ratio of more than 90 percent. Rumours suggest that it could come with up to 1TB internal storage. While the phone could run the Exynos 9820 processor in India, it is expected to retail in the US with Snapdragon 855, that was launched recently. The Snapdragon 855 processor is also 5G-ready and Samsung is partnering with Verizon to launch its 5G-ready Galaxy S10+ in the first half of 2019.